As longstanding calls from activists to abolish Immigration and Customs Enforcement have gained steam in the wake of the family separation crisis, and as more politicians and candidates for office take up the rallying cry, there has been a spate of articles and op-eds all asking the same questions: What does abolish ICE mean? Do we really want to abolish ICE? Can it even be done? And if that’s the goal, is it a winning strategy for Democrats or will it only boost the chances of Republicans maintaining control of the House, Senate, and a majority of state legislatures? The current media narrative is of a movement that is oddly devoid of the people who make up the movement—immigrants themselves who for years have been the ones to, often quite literally, put their bodies on the line to end the deportation and criminalization of undocumented Americans. Yet there is nothing abstract about the call to abolish ICE for organizers like Erika Almiron, the executive director of Juntos, a Philadelphia-based Latinx immigrant rights group. She is clear-eyed about what needs to happen. “When we say abolish ICE, it also means decriminalizing migration and the ways that migrants are treated as criminals,” Almiron said. This was the case for many of the immigrant rights activists and organizers I spoke with in recent weeks. For them, the call to abolish ICE is not only a call to dismantle an agency that has, in its short history, been the engine of a staggering number of deportations. It is a demand to end the raids, at courthouses and workplaces and hospitals, that terrorize communities. It is resistance in the face of a system that conflates immigration with a national security threat, and that treats immigrants like criminals. There is no movement to abolish ICE without the transformative, disruptive activism that took place under previous administrations. And yet, the current media narrative around the movement to abolish ICE erases people like Jennicet Gutiérrez, the undocumented trans woman and immigrant rights activist who interrupted President Obama at a White House Pride event in 2015. “Release all LGBTQ immigrants from detention and stop all deportations,” she called out, an act for which she was criticized and mocked by many, including Obama himself, who responded to her protest with the admonition: “You’re in my house.” She had disrupted what was supposed to be a sanitized and tidy event in celebration of Pride month, under a liberal president—she had broken the rules of decorum. Others at the event shouted “Shame on you!” and “This is not for you! This is for all of us!” as she was forcibly removed from the room. Similarly erased is #Not1More, started in 2013 by the National Day Laborers Organizing Network (NDLON), that then expanded to include dozens of immigrant rights groups around the country, a campaign whose central demand was an end to all deportations. This is the legacy of activism that connects to the present day, and in Philadelphia, a new coalition of leftists groups like the Democratic Socialists of America has teamed up with immigrant rights organizations like Juntos to decouple immigration enforcement from the criminal justice system and work to end the detention and deportation of undocumented immigrants. Far from a “murky” goal or rhetorical position, what they’re accomplishing offers a model of how the energy to abolish ICE can lead to local victories. For years, Juntos has been working with other advocates to both close down the notorious Berks County Detention Center, the only publicly run family detention center in the country, as well as end the city’s longstanding agreement with ICE to share its database of arrest records, the Preliminary Arraignment Reporting System, known as PARS. Dozens of parents and babies took over the offices of Thomas R. Decker, New York field office director for ICE Enforcement and Removal Operations at the ninth floor of 26 Federal Plaza. Despite Philadelphia’s status as a so-called “sanctuary city,” the reality is that it is far from a haven for undocumented immigrants. According to an investigation by ProPublica and the Philadelphia Inquirer, the city’s local ICE office, which covers a three-state area, is the most aggressive in the nation, arresting more immigrants without criminal convictions—64 percent, compared with 38 percent nationally—than any other regional office. When I spoke with Juntos on the phone, activists from the local chapter of the Democratic Socialist of America and other groups were in the midst of an ongoing protest reminiscent of Occupy Wall Street, camping out first in front of a local ICE office and then in front of City Hall. Juntos has been working closely with the occupiers, who had reached out to the organization to ensure that the demands it put out were closely aligned with those of local immigrant rights groups. “There’s this nice place right now where I think the Occupy folks see themselves as an instrument to this larger movement against the criminalization of black and brown folks,” Almiron said. This level of collaboration and coordination does not exist everywhere, which has led to some tensions between long-standing immigrant rights groups and newer activists. In New York City earlier in June, during an #OccupyICENYC protest in which people blocked the entrance to an ICE processing facility in downtown Manhattan, groups like the New Sanctuary Coalition and Make the Road New York were dismayed after ICE retaliated by no longer allowing detained immigrants to appear directly before a judge, instead teleconferencing people in for their court hearings. “It was well-intentioned, but if you block that, you are doing away with a tiny slice of due process that they still have,” said New Sanctuary’s Ruiz. The encampment, in consultation with local activist groups, soon moved. 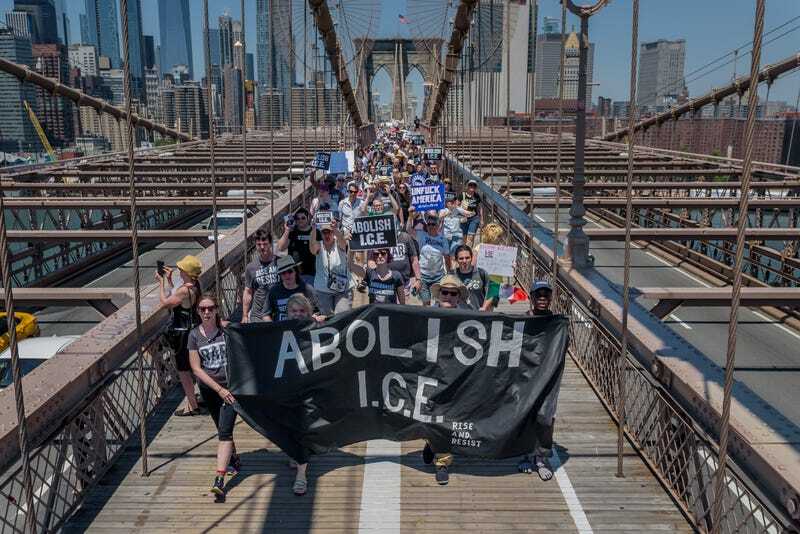 But in Philadelphia, local socialist groups haven been working with immigrant rights activists this past month to rally under the banner of abolish ICE. At the beginning of July, Occupy ICE protesters first marched to the ICE office in Philadelphia’s Chinatown neighborhood and then kicked off their encampment, at times blocking the entrances and gates to the building. They then shifted to City Hall once the Philadelphia police department moved to break up the initial camp, throwing away their supplies and arresting almost 30 protesters. Occupy ICE activists vowed to stay until Mayor Jim Kenney ended the PARS agreement. A week later, Kenney met with Juntos and local Occupy ICE protesters to discuss the city’s data sharing agreement. And on July 27, Kenney announced the city would no longer share its database of arrest records with ICE once its current contract runs out in August. After years of organizing led by immigrant women from groups like Juntos, and less than a month after Occupy ICE activists had set up their tents—they had won this particular battle. “We now serve as a real beacon of light to other cities across the country who may be asking themselves, ‘What more can I do to protect families who are being torn apart?’” Almiron said in a statement. Given the impossibility of abolishing the agency through legislation in the near-term, this is a version of what abolish ICE can look like in practice. The collaboration that occurs between the agency and city and state governments can be made harder to carry out, and the operations it aims to conduct in secret can be made public. If ICE can’t be dismantled in the immediate future, the machinery of deportation can be slowed by people working collaboratively to jam up its gears.